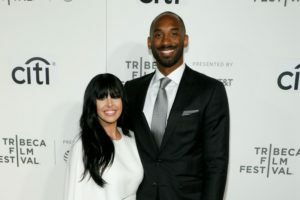 After Kobe Bryant retired from basketball, his next career move would easily qualify as a highly unanticipated and untraditional move for an ex-athlete: he wrote a poem. His lover letter to the game he’s been “deeply in love with” since the age of six was turned into a short film that premiered at the 2017 Tribeca Film Festival. “Dear Basketball” made its Tribeca debut on Sunday April 23 as part of the Tribeca Talks series. The animated short centers around the former NBA all-star’s timely retirement from the sport that he “never saw the end of the tunnel [of].” Since Bryant is a legend himself, he naturally turned to one of the best animators to help turn his vision into a reality. Glen Keane, a veteran of the Walt Disney Animation family, quickly became the perfect person for the task. The animator has created some of Disney’s most beloved characters, including: Ariel (“The Little Mermaid”), Tarzan (“Tarzan”), and Pocahontas (“Pocahontas”). However, creating a animated version of Bryant surprisingly proved to be his toughest challenge yet. 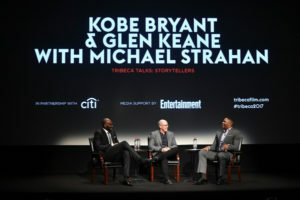 and Michael Strahan at the Tribeca Talk for “Dear Basketball”. Although there hasn’t been an announcement of future distribution plans as of yet, we strongly believe this short will wow audiences outside of the festival fairly soon.